Suspend your disbelief for the purposes of this design, and assume for a moment it were within the realm of possibility – or might be someday soon. The idea, if nothing else, is a thing of beauty. 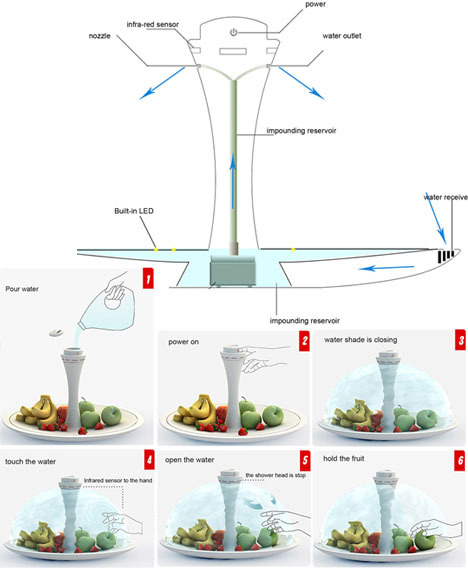 A simple, slightly-curved dish holds fresh fruits – a pillar in the middle ensures freshness by deploying a film of water around it in all directions, protecting what is inside. It locks in moisture and freshness but keeps out the flies and dust. 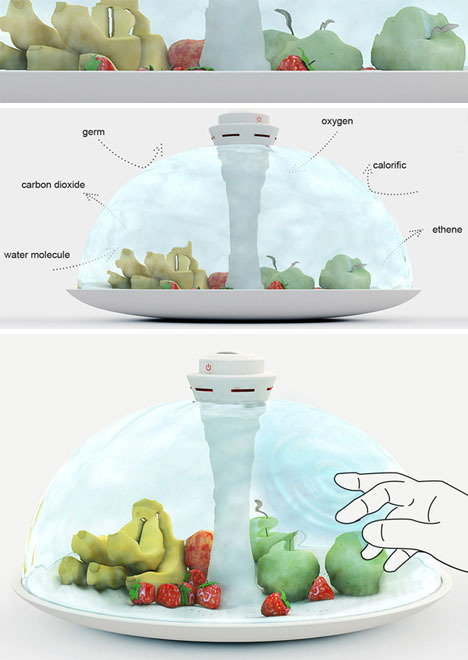 Even if it could be produced as such, making it remotely energy efficient may be a big challenge. And now for the real stretch: a sensor ‘sees’ your hand coming and parts the flow of water around it, letting you access an apple, orange or banana as needed, then closes around you as your limb retreats. Designer Yitu Wang does not yet have a method for manufacturing this (no surprise there) but who knows what may be possible with new technologies down the line.